Ever thought about selling your clothes online? How about selling on Poshmark? If you’re looking to get rid of some items in your closet and want to make a little extra cash doing it then selling your clothes on Poshmark is a great option. If you were wondering how to or whether it’s worth it to sell your clothes online (other items as well) then this article is for you. By the way, Poshmark is NOT sponsoring this post, I just really wanted to share my tips and experience selling on Poshmark. Sign Up for Poshmark using my code: ESAVINGSBLOG and get a $5 Credit! Sign up here. Poshmark is a super popular app and website for buying and selling clothes, shoes, makeup, and more. I like Poshmark because they make selling your stuff online super easy. You basically just snap a photo of the item you want to sell with your iPhone or Android device, fill in a description, set the price, and you’re done! They take care of the shipping label, you just print it and the buyer pays the shipping. You can even get free boxes (keep reading for links on getting free boxes). I’ve had an account with Poshmark for some time for shopping purposes but didn’t really use it. But once I started on my decluttering journey I decided to give Poshmark a try. I wanted to earn some extra money on some of my gently used clothes and a bunch of new with the tags on them items I was discovering in my closet. I am ashamed to say that I had quite a bit of these items in my home! Once I rounded up about 10 items I started the process of listing them ( Poshmark recommends listing as many items as you can so your Poshmark closet isn’t empty). After looking at some other Poshers (a.k.a people who sell on Poshmark) I discovered that the top sellers had a nice theme going where they would take pictures of their items with pretty backgrounds and keep it consistent throughout their postings. So let’s get to the tips. Since most of my items I started to sell with were makeup, shoes and other small items I decided to use my round beige ottoman as the backdrop to my photos. For clothes, you can use a nice wood floor, hang on a nice door or even use a nice dress form mannequin (these are great if you plan to sell long-term which some Poshers do (more on that later). Take lots of photos and make sure you show any wear and tear of the item or any imperfections so that you’re not deceiving the buyer (remember you don’t want returns and you want good reviews to make more sales). Below is an example of two of my photos but I take at least 5 pictures and use the best photo for my “cover” photo which will show up in the feed as people scroll through the Poshmark app. You can check out my closet here to see what I mean. You will want to take pictures of any tags if new and of the brand name labels to show authenticity especially if it’s a popular or designer brand. You want to be as descriptive as possible when writing your products description. I am actually trying to get better at this myself. You want to include everything you can such as size, brand, any imperfection notes, color and measurements when possible especially with clothes because people are less likely to buy without this information. I use a clothing measure tape to measure clothes and when possible I leave the measuring tape on the product when I take the picture so they can see the dimensions. 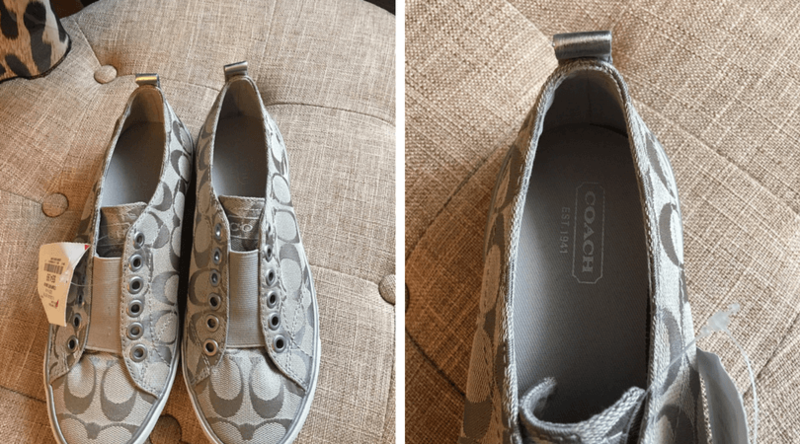 You also want to fill out as much as you can when listing your item because people are doing searches in Poshmark and if they’re looking for Coach sneakers size 6, for example, you want to make sure your listing will show up for them as a result. I quickly learned this after getting several low offers on my items. Pretty much EVERYONE makes an offer and hardly anyone will just buy at the price listed. For this reason, you want to price your item higher than you’re willing to actually take. How do you know what to price your item at? Look around and do some searches on Poshmark to see what others may be listing similar items for and that should give you an idea. For example, my Coach sneakers happen to be brand new, I spent $54.99 on them (I show the price tag in the photos) and I listed them at $45. With that price, I will make $36 but most likely I will be getting lower offers so that’s why I started at $45. You can start even higher and once you get a bunch of likes on your item you can lower the price in 10% increments and it will notify everyone who liked your item that you lowered the price! This is a great way to keep eyes on your items and is a strategy many Poshers use to get more people to share and buy their items. Follow, Follow, Follow, and Share, Share, Share! To get your listings seen you need to follow lots of other Poshers and share their items! Poshmark is a great community of buyers and sellers and you will get lots of shares and follows this way. You also want to keep sharing your own items as you get more followers. Share your items to a Posh Party! Posh Parties happen often and when you can you want to share your listings to them! Most parties have themes so you have to fit the theme to share to that particular Posh Party. For instance today they’re having a Nike, Adidas, and Under Armour party so if you had listings under those brands you could share them. If for some reason it says not eligible it’s probably because you didn’t select a brand when you made the listing so make sure to go edit your listing and select the brand. Sharing to Posh Parties gets your listings to more people! They will get shared a lot during the parties. If you’re on Poshmark make sure to follow me @esavingsblog and leave your Poshmark name or link in the comments of this post and I’ll follow you back and share some listings! If you’re not signed up yet use code: ESAVINGSBLOG to get $5! Sign up here. First of all Congrats! You made a sale but now what do you do? First, you want to make sure you’re prepared for the sale before you actually make one! This is so important because you want to ship it out as soon as you can, I usually ship the same day or the day after. Print your label. Make sure you have a working printer so you can print out the label that will get emailed to you upon a sale. Poshmark takes care of creating the label, you just need to print it. Order Free boxes from USPS now! Yes, there is no need to buy boxes because you can get them at your local post office for free or shipped to you absolutely free right from the USPS website. IMPORTANT: Make sure they say PRIORITY MAIL not flat rate! Any other USPS boxes, including “Priority Mail Flat Rate”, “Regional Rate” and “Express Mail” are NOT allowed and may cause delays in shipping and receiving your earnings. Good news: standard brown boxes and padded envelopes that you have around the housework just as well! Order Your boxes here NOW before you make any sales. Remember only PRIORITY MAIL NOT FLAT RATE PRIORITY etc. I ordered the Priority Mail Box – 1095, Priority Mail Box – 1096L and the Priority Mail Shoe Box for example. You may be thinking really? But Poshers love pretty packages! You can do this easily and cheaply by using pretty tissue paper to cover your products and by adding a simple thank you note as a special touch. 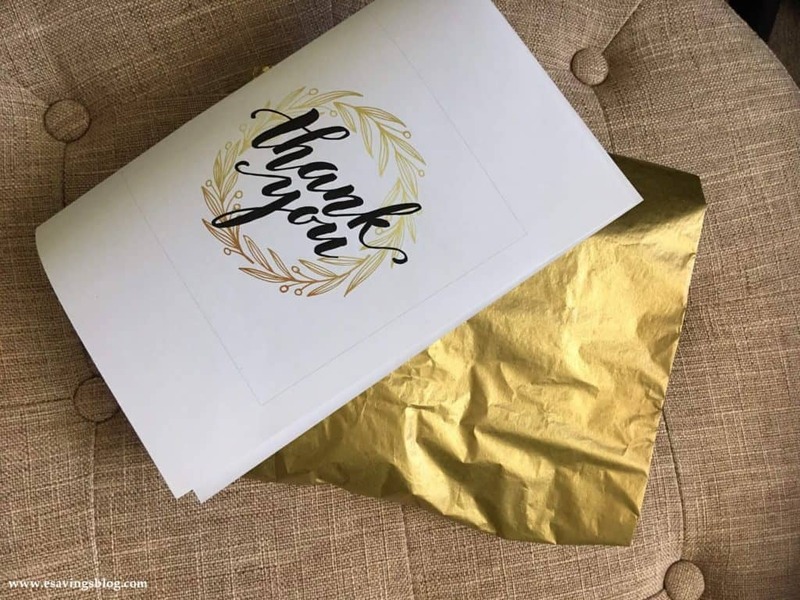 You can grab thank you notes and tissue paper from the dollar store, or order them on Amazon. I usually write a special thank you note and tell them to come back again. When I can I even add a freebie, I have lots of free samples I collect so these are easy to add to my shipments. Now that you have your box, your label, and your thank you note just put it all together. If your product is breakable or may get damaged by rain I usually add bubble wrap or put it in a plastic ziplock type bag to protect it. Tape the label to the box and bring your box to the post office, give it to your mailman or put it right in the blue mailbox. That’s it! I mentioned earlier about becoming a long time Poshmark Seller, some people end up liking selling on Poshmark so much that they open up a boutique on Poshmark or they shop thrift stores and then resell on Poshmark for a profit. Opening a boutique requires a simple certification which can be completed right in your Poshmark account. This can be a great side hustle but I recommend starting with your own items first to get the hang of it. Hi Koryn! I just followed you and shared one of your listings :). Good luck with selling on Poshmark!